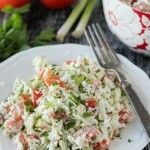 This creamy cauliflower salad with tomatoes and fresh herbs is so crunchy, fresh and delicious. 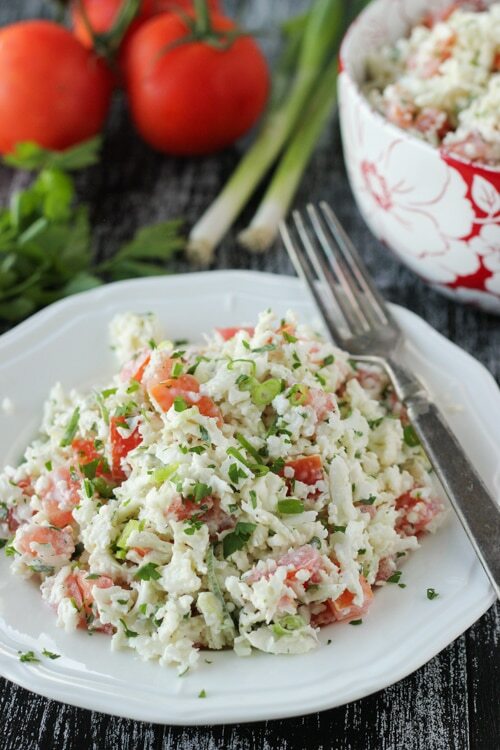 Cauliflower and tomatoes complement each other beautifully in this refreshing salad. We made this often as I was growing up and I still love to serve it, especially with seafood. 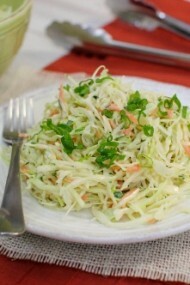 It is a great variation from coleslaw. The cauliflower is crunchy and grating it makes it almost fluffy. 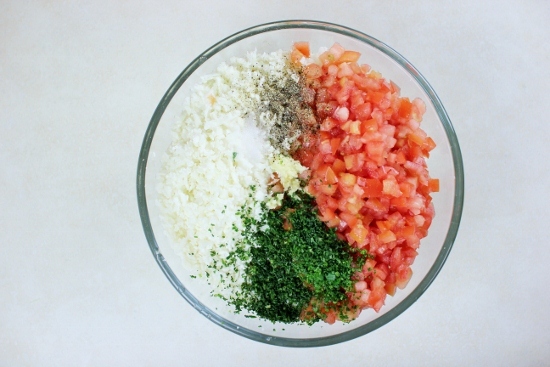 Tomatoes, garlic and herbs are then added and dressed with mayo and sour cream. 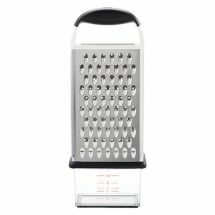 Grate the cauliflower on the large holes of a box grater. Seed and chop the tomato. 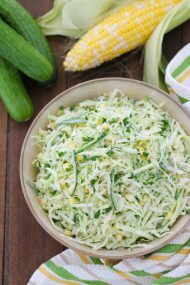 I often add cucumbers and radishes to this salad too. By the way, don’t overdo the garlic. You need only a tiny amount, otherwise it will overwhelm this mild salad. 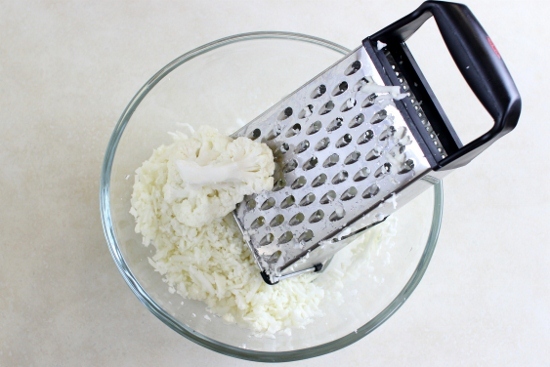 Grate the cauliflower on the large holes of a box grater. my hard to please husband loved this! thanks!! we loved the salad. I have made salads with cauliflower, but grating it was different and interesting. Will definitely make again! Made this salad today! Very good combination of veggies! 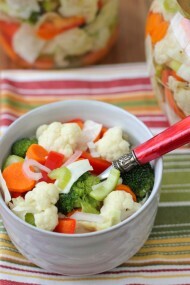 So far my favorite combo for cauliflower salad ;-)! 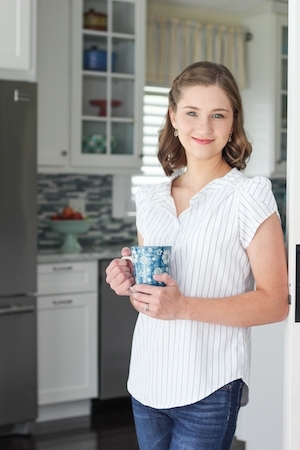 Thank you for a taking your time to share great recipes with us! 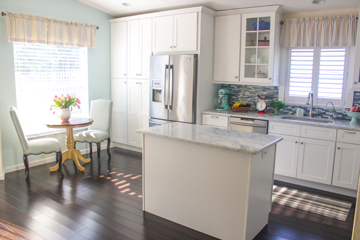 Husbands are good judges of taste, and the most important ones, since we cook for them:). Great job, Milana. I was wondering, have you ever tried making this salad ahead of time? Do you think if i grated the cauliflower, and prepared the rest of the ingredients except for the tomatoes the night before and add the tomatoes right before serving that it would still turn out yummy? You can make this salad ahead of time. I never make salads from fresh ingredients ahead of time, especially this one, simply because they are so easy and quick to prepare. I prefer the taste of texture of vegetables when they are crunchy and fresh. 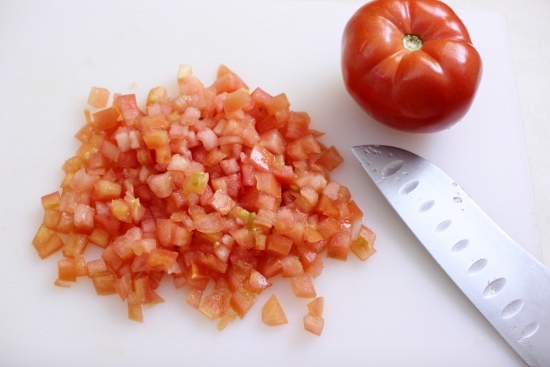 Any time you add salt to salad, it will draw out moisture and make it softer, even if it is very slight. For this reason, I make salads right before serving them. I haven’t tried this salad before, it sounds really yummy. Going to make it on Christmas. Thank you for it! I hope you enjoyed this salad, Olya. We make it a lot in our family. Hi Olga, I just wanted to say thank you for posting such wonderful recipes. I have been trying to do meal planning, just to make my life easier and a bit more structured, and have pinned a bunch of your recipes. Today I made your Salmon cakes, with this cauliflower salad, and it came out perfect. My husband and my sister and her spouse, who were visiting, thought it was delicious! Last week I made your rice meatballs in the red sauce, and it was a big hit also, especially with my kiddo. 🙂 later this week I plan to try making your rice casserole. Love how clear your recipes are, and that many of them are good sized portions, so we can have left overs the next day, or I can freeze some. Thank you for your hard work; certainly makes my life easier, and more flavorful. Thank you so much for such a sweet comment, Elvira! You really made my day. I’m so happy to hear that you are enjoying the recipes. The Salmon Cakes and the Cauliflower Tomato Salad are personal favorites of mine:). Cauliflower DOES have a strong smell:). 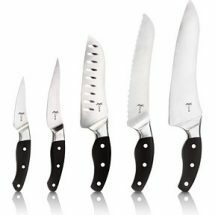 I’m so happy to hear that this website is helpful to you in coming up what to cook. Thanks for taking the time to write. Thank you so much for your kind words, Tzivia. 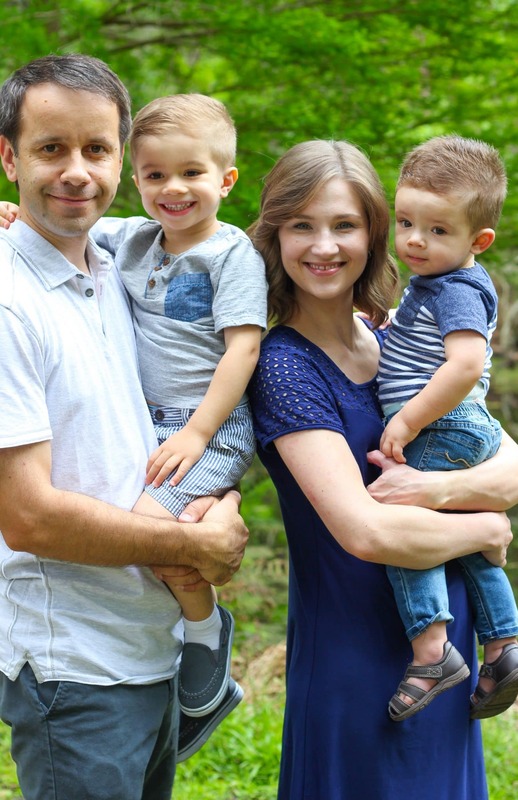 I am so glad to hear that you are enjoying the blog and videos. My tip for storing fresh herbs is to wash them and then wrap them in a damp paper towel and keep it a ziplock bag. Here’s a post I wrote about Storing Fresh Herbs. Good for you, for coming up with a way to make this salad that will work for you. Mustard sounds like it would taste great in here.